The outcome on this was expected, but at least now it’s official. Despite the World Trade Organization developing international regulations governing trade, the WTO actually has no mechanism to enforce those regulations when violations are carried out by an international organization, such as ISO. Instead, WTO can only process “disputes” between nations, and not individual organizations. 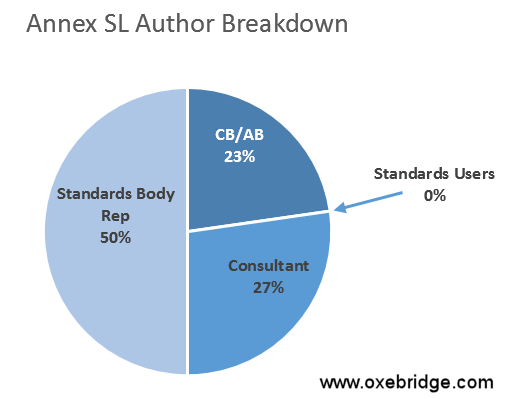 I’ve written at length about this, but the short story goes like this: when ISO elected to shift the development of huge swathes of requirements for its management system standards (MSS) to its internal Technical Management Board (TMB), published later as “Annex SL,” it violated not only its own internal ISO Rules of Procedures, but also the rules governing standards development under the WTO’s Technical Barriers to Trade (TBT) regulations. Those rules require that such standards be written under certain conditions, such as by representative delegates of ISO’s member nations, without the dominance of any single key stakeholder group, and with the participation of developing nations. The TMB did none of these things, writing Annex SL on its own and later submitting it for a nonbinding “enquiry” vote when it was published as ISO Guide 83. Only 19 nations voted for Guide 83, and 6 voting against it; this means that 137 nations never voted at all on it. 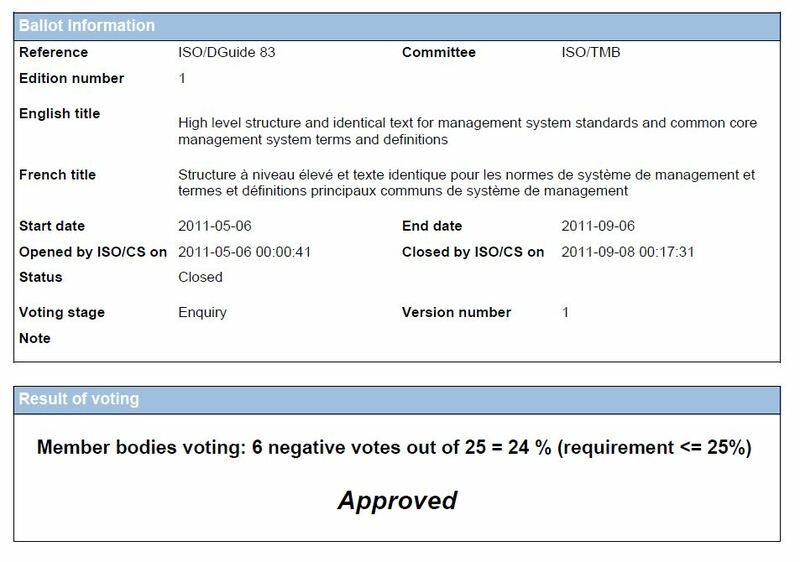 Yet, because of the squeaky math, ISO claimed the text was “approved” because 19 represented 76% of the nations that voted; ISO ignored those that didn’t vote at all, which is a common practice. My sources inside ISO tell me that at the time, ISO was able to “focus” the voting to nations it knew would accept it, via targeted emails and some phone calls, and made only a single mention of it to the rest, so that they were largely unaware the vote was being held. Despite the vote, or because of its poor showing. ISO scrapped Guide 83 and then republished it as a mandatory “Annex SL” document which was not subject to any voting at all. A comparison between the original Guide 83 text and the final Annex SL text show the majority of changes were slight wordsmithing and punctuation, meaning no ISO member nation comments or feedback were ever incorporated. The result was that exactly zero MSS standards users were involved in Annex SL’s development, and not a single developing nation. Furthermore, the overwhelming stakeholder “interest groups” responsible for it were standards body representatives, MS consultants and certification/accreditation bodies, who profit by the sale of standards. The consultants were previous CB reps, in fact. Meanwhile, the WTO’s Technical Barriers to Trade Agreement (TBT) contains huge sections of its text dedicated to rules intended to govern “Development of International Standards,” and which name-drops ISO itself in the regulation. That text includes six “principles” for standards development, of which ISO violated all six when it pushed Annex SL on the world. ISO then just lied and published a self-assessment conclusion that said the exact opposite. The World Trade Organization is an inter-governmental organization and its mandate covers the negotiation and administration of trade agreements among its member governments. [Disputes] can only be handled by the authorities and the legal systems of the countries concerned. Trade disputes are brought to the World Trade Organization when one member feels that another member’s trade practices affect world trade in a manner that is contrary to the WTO agreements. Since WTO’s members are nations, and since ISO is not a nation (yet), ISO can never be held accountable to violations of WTO rules, no matter how flagrant or damaging to the world’s economies. Since China now manages ISO, but does so through the handstrings of a corporate individual without direct ties to its government, even a complaint against China for ISO’s violations wouldn’t work. Besides, ISO has been violating WTO long before China took it over. Which raises another interesting angle: by manipulating ISO, China can now impact on world trade and push violations of WTO regulations without anyone being able to hold them accountable, using ISO as a pass-through. The US and other nations are helpless to file a dispute with WTO. Clearly the WTO’s “procedures” are lacking, and this will inevitably end in disaster for many of the economies on the planet. But it would require one nation to exert herculean efforts to unseat ISO from its perch alongside WTO, and the countries most likely to succeed in such an effort — the US, UK or Germany — are also the least likely to even try, given their conflicted positions supporting ISO. So while I’ll keep pulling on that WTO thread, we know it’s even less likely to have an impact than before, and ISO — who’s reading this right now — is gleefully rubbing its hands in anticipation of what other international regulations it can violate next.